Former US Republican President George Bush Sr has confirmed he voted for Democrat Hillary Clinton in the 2016 presidential election, labelling Donald Trump a "blowhard". His son, George W Bush, said he worries that "I will be the last Republican president", even though President Trump is a Republican. "This guy doesn't know what it means to be president," the younger man said. The pair's comments come from a new book, titled The Last Republicans. Preview excerpts from the book were published by US media outlets. "Blowhard" is a casual term for a person who is boastful or blustering, the Oxford English Dictionary says, and it is usually meant as an insult. "I don't like him. I don't know much about him, but I know he's a blowhard. And I'm not too excited about him being a leader," said George Bush Sr, who was president between 1989 and 1993. He also told the author of the book, Mark Updegrove, that he felt Mr Trump ran for the presidency because he had "a certain ego", in remarks reported by US media outlets including CNN and the New York Times. 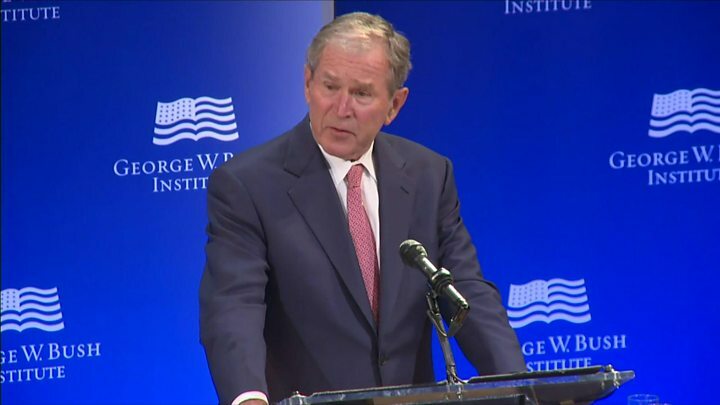 George W Bush, adding to his remarks that Mr Trump "doesn't know what it means to be president," said "you can either exploit the anger, incite it, or you can come up with ideas to deal with it." The younger Bush's comments are in keeping with a speech he gave in late October widely seen as a critique of the new president, though it did not name him. During the 2016 presidential campaign, neither former president endorsed Donald Trump. 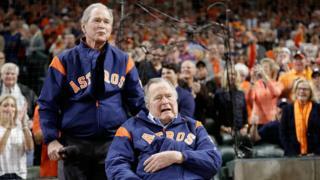 But in the new book, George Bush Sr confirmed that he voted for the rival party's candidate in Hillary Clinton. George W Bush, however, said he simply left his presidential ballot blank. The book's title, Mr Updegrove told CNN, came from a remark made by George W Bush during the presidential election. As the previous Republican president before Barack Obama took office, he told the author: "You know, I fear that I will be the last Republican president." "And it wasn't just about Hillary Clinton becoming president, as the Republican Party was having a difficult time finding itself. It was because Donald Trump represented everything that the Bushes abhorred," Mr Updegrove told CNN. White House Press Secretary Sarah Sanders hit back at the former presidents in a statement. "The American people voted to elect an outsider who is capable of implementing real, positive, and needed change - instead of a lifelong politician beholden to special interests," she said. "If they were interested in continuing decades of costly mistakes, another establishment politician more concerned with putting politics over people would have won." Meanwhile, former head of the Democratic National Committee, Donna Brazile, has claimed she seriously considered replacing Hillary Clinton with Vice-President Joe Biden as the party's presidential candidate during the campaign. In extracts from her own book published by the Washington Post, she said Mrs Clinton's campaign had "the odour of failure" and alleges a huge array of failures and incidents of mismanagement within the party. Ms Brazile was herself at the centre of a controversy when she fed the Clinton campaign a question in advance of a debate against Bernie Sanders during the race for the Democratic nomination.